Output Management pertains to the formatting, management and distribution of data, and an output management solution ensures that print and electronic documents are distributed and provisioned securely and efficiently. Companies that have an output management system can also integrate all application formats, forms, printer languages, drivers and operating systems. In today’s fast-paced business environments, success depends directly or indirectly on employees’ ability to transfer and delivery documents and information to customers, suppliers, team members and other stakeholders. Companies that implement an output management solution can avoid problems and delays that can result from sending inaccurate documents as well as increases in printing costs. Companies that do not implement an output management solution often find that their printing and distribution network does not work as efficiently as it could, and productivity suffers as a result. Cost-efficiency: An output management system can optimize and streamline your entire business process and can be linked to document distribution and output. Support for your company’s support: Modules for device/driver management and device/job monitoring facilitate your support administrators’ and Helpdesk’s printing and electronic distribution needs. Reduction in IT complexity: An output management system controls all print tasks that were previously completed individually using other solutions. Always available: Load distribution and failover mechanisms ensure permanent availability of all critical output servers and devices. Transparency: Output management delivers transparency for all print processes. Green IT: Electronic distribution lowers paper consumption. Independence: Output management provides the advantages and features of a COM platform independent of machine models and manufacturers. Most older print infrastructures are inefficient. 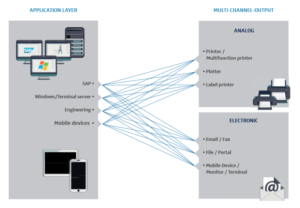 As a case in point, the image below shows the different applications and the multi-channel outputs that are required for older printing infrastructures. 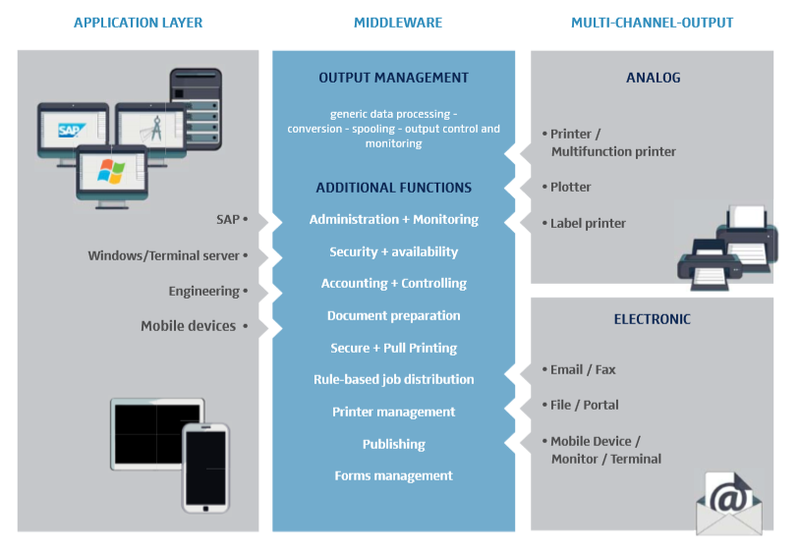 An output management solution eliminates these inefficiencies because all printing and distribution processes are managed from a single location, as illustrated in the diagram below. SEAL System’s centralized output management system ensures secure, efficient printing and distribution of your documents. SEAL System’s output management solution links all applications with every output channel. By processing the data format from every company application (SAP, Windows, Microsoft Office, terminal servers, PLM, CAD, smartphones, tablets, web-applications, digital archives, and DMS), applications can be linked with all output channels at throughout your company. SEAL Systems achieves this with PLOSSYS, its output management engine and the heart of its solution. SAP: Output Management – SEAL System’s output management system provides device-neutrality, security and transparency for SAP document and information distribution. Windows and Terminal Servers: Output Management – The Windows MasterDriver works in SEAL System’s PLOSSYS (output management engine). Therefore, one driver can transact all analog and electronic Windows processes. Engineering: Output Management – Our output management system provides automated and coherent document distribution for Teamcenter, SAP PLM and many more PLM/PDM systems such as Windchill, Enovia, Keytech PLM and Profile. Mobile Printing: Output Management – With SEAL System’s PLOSSYS, printing documents, photos or email attachments is possible on any printer within a network. And, the process is always device-neutral, transparent and secure. Interested in SEAL System’s Output Management System? 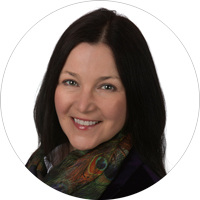 Contact Debra (email, LinkedIn) for more information.